Tales of love, a cappella and everything in between. A brand new immersive show from UK Community A Cappella Champions and musical storytellers extraordinaire, In the Smoke. Open Mic Night* features a diverse cast of romantic winners and losers navigating their way through dates, propelled by delicate duets and hot-blooded harmonies. BLOG: One month until independence! As well as picking up two new arrangements (Happy and Falling Slowly, both by Hazel), we brushed up on Joel’s mash-up of Fidelity/Pumpkin Soup, put the finishing touches to Dre’s Wichita Lineman, resurrected James’ Dublin Sky and started work on body percussion for his new four-hander, Water Fountain. We are so excited right now. GIG: February 7: Friday Night with In the Smoke! In the Smoke takes great songs you know and great songs you don’t and arranges them for a cappella voices, retaining what makes them great and adding our original style, flair and stagecraft. Our five new members will be taking centre stage for our first London gig since August, with a batch of premiere arrangements alongside some of your favourites.Doors open from 7pm for a 7.30pm start, with tickets on the door at £5. Rather reasonably priced bar available before, during and after. The last couple of rehearsals have been spent putting the final touches to our set for this years Voice Festival Community Showcase! It’s going to be great. 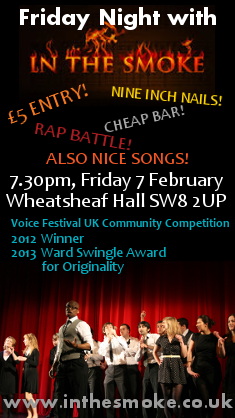 We’ll be singing our most varied set yet, leaving comfort zones trailing behind us!